US only Beatles album Yesterday And Today is released and then quickly withdrawn following a torrent of complaints about the Butchers block cover photo. Bassist Clint Warwick quits the Moody Blues. Klaus Voorman is offered the job but he is also considering an offer to replace Jack Bruce in Manfred Mann. 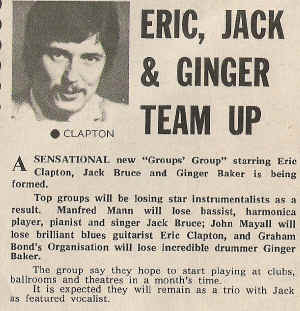 Jack Bruce announces that hes joining a new instrumental trio called The Cream. 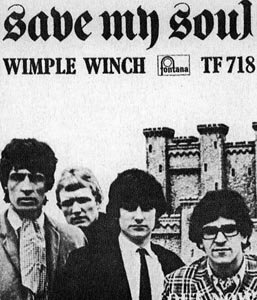 Manfred Mann leave HMV and sign a deal with Fontana. The Easybeats sign to UA Records and move to the UK. The group of British and Dutch ex-pats have established themselves as the most popular group in Australia. 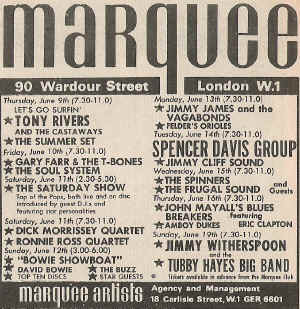 BBC TV Top Of The Pops-The Beatles make their one and only live performance on TOTP on the 16th. 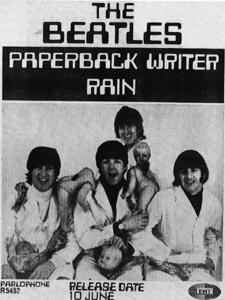 They mime to Paperback Writer and Rain. 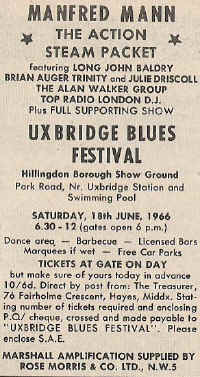 The Hollies (Bus Stop) and The Yardbirds (Over Under Sideways Down) also appear. Making Time: Gripping groupy groover with cool drumming and guitar played with a violin bow. Certainly an original sound, rather like a swinging Queen Mary fog hooter. A technique that's going to spread.